Jason Probst is the State Representative for Kansas District 102 in Hutchinson and proudly speaks for the people who reside there. Most recently, he has worked at The Hutchinson News, covering a span of nearly 15 years, beginning as a production employee on the night shift and eventually becoming a reporter, and later newsroom editor and primary opinion writer. During his time at The News, he steadfastly advocated for the wellbeing of working families who too often struggle to make ends meet. He will continue to stand up for this cause as a legislator in Topeka. 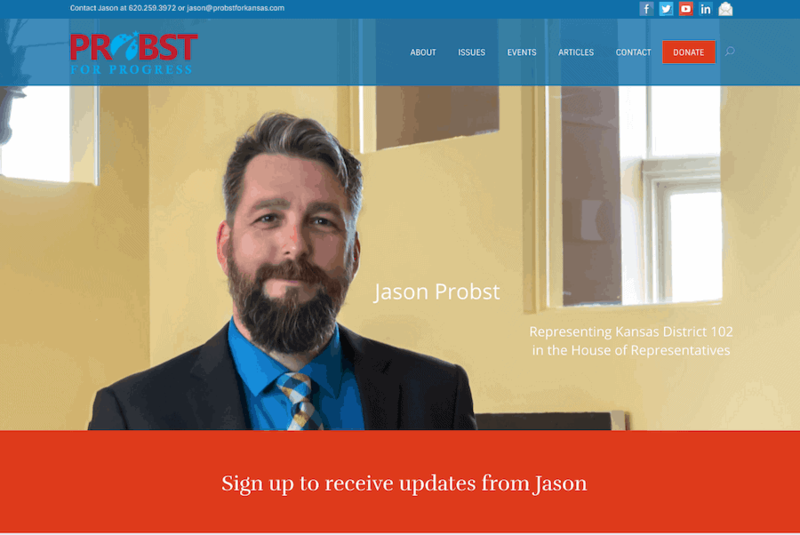 This new legislative position requires a new website, of course, with specific needs such as strong communication options, clear and secure ways to donate, ways to get involved, a venue for Jason’s articles, and and several ways to discuss the crucial issues facing Kansans today. To plan the website, we met at Scuttlebutt’s in Hutchinson, brainstorming and sharing ideas, and the current website is the result of that conversation as well as many followup email and text message discussions to work out the details. I think we have achieved all of our goals with aptly named Probst for Progress. Check it out, and if you feel so inclined, drop Jason an online message with your comments and questions. He wants to meet you and hear your ideas!